Type 1 Diabetes Newly Diagnosed - Now What! I was diagnosed with type 1 diabetes when I was twenty and life as I knew it completely changed forever. I was a student, in my third year living away from home and I had finally moved out of my uncle's house and was doing the whole grown up thing of having a part time job, paying bills, buying and cooking food, doing laundry, etc. I hadn’t been feeling well for a few weeks but put it down to the unsociable hours of working in a fast food chain. But, when I literally slept for five days straight and still felt tired that just didn’t add up, especially with the fact that I couldn’t drink enough of anything fluid or the running to the bathroom every half hour to empty said fluids. I spent nine days in hospital where I learned how to inject insulin and how to use a glucose meter. When I got home I hadn’t a clue what to do next! I had no idea what my future would now look like carrying all of these hypodermic needles around everywhere I went (that's your reminder that my diagnosis was 25 years ago). Outside, I was calm and focused on what I had to do to take care of myself. Inside, I was in a state of shock, my brain was trying desperately to figure out what my future would look like and what next. More than 15 years later, I came across the Australian’s Type 1 Starter Kit: A Guide for Newly Diagnosed Adults with Type 1 Diabetes and I just thought I wish I had this when I was diagnosed. It’s a practical beginner's guide on how to navigate this new life with type 1 diabetes in the first couple of months. My inspiration for this blog post comes from the “What to do when you are diagnosed with type 1 diabetes in the first month” section of that guide. So here’s my 2018 take on what to do when you are diagnosed with type 1 diabetes in the first month if you live in Ireland. 1. Have a bit of a freak out BUT breathe! Everything WILL be OK! Yes, there is a lot to learn and you’re brain feels like it’s going to explode right now but you will learn it over time. You’re number one objective for these next few weeks is One Day at a Time and if you need to One Hour at a Time. Treat the low glucose. Don’t stress too much about the highs but ask your team at what point you should worry about the highs and when to call them. This doses of this new medication called Insulin will time to figure out and adjust and in the first weeks, months you will need guidance from your health care team on how to do this. It will get easier as you gain more knowledge! You may have been given a blood glucose meter when you were diagnosed and it will go everywhere with you. So, it’s important to find one that works for you! And have a spare. There is going to be times when the batteries run out or it needs charging, or you just went upstairs and don’t feel like going back down the stairs to get your meter. Glucose meters are free and you can get them from your diabetes clinic, direct from the manufacturer and sometimes from your chemist. There are all sorts of different meters with all sorts of whistles and bells. It is recommended that you change your meter every two years so you’re going to go through a lot of them. Some of the glucose meters available in Ireland. Usually, this process has been started for you while you are in hospital but just in case it hasn’t been heres some info. The LTI Book provides all of your diabetes medication and supplies free of charge. It’s a government sponsored scheme. different from a Medical card and a GP services card, which since 2015, you can have in addition to your LTI if you qualify. You can get an application form from your local health office or your GP, it needs to be completed by you and your doctor and must be returned to your local health office. Apply through your community welfare officer at your local health centre or download the application form here. If you have Drivers’ License you must notify your local National Driver Licence Service (NDLS), so that it can noted on your driving record. This is required by law. You will then, within a specified timeframe, be issued with a new, updated licence at no extra cost from the NDLS. Driving with type 1 diabetes does mean that you have to be a little more responsible behind the wheel, for example, "Don't Drive under 5 mmols" and always have fast acting sugar in the car. The RSA have put together this easy to follow guide on "Driving and Diabetes" and what those precautions are. It's very much worth a read. ASAP! As soon as you can after you have been diagnosed. Car insurance companies CANNOT increase your insurance premium because of your diabetes unless they can show that you, as an individual, are more at risk than you were prior to your diagnosis, which is virtually impossible. However, if you do not inform them that you have diabetes and you make a claim the insurer can invalidate your cover. 6. Who do you call when you have questions? When you start to adjust to life with type 1 diabetes you will have questions at every turn for the first couple of weeks. And not all of those questions will occur to you during clinic hours. So if the question can wait, write it down and call your clinic the next day. If the question is urgent see number 7. Most major public hospitals will have an endocrinologist on call, so you could call and ask for them to be paged. In a serious emergency, call an ambulance. But whatever it is, make sure you have a number in your wallet or programmed into your mobile phone because you can guarantee it will be 3am on a Sunday when you have an urgent dilemma! Have fast acting glucose everywhere! Some examples of fast acting glucose are Dextrose, Lucozade or Gluco Tablets (from Pharmacies), Sugary drinks such as regular Coke or Orange, Jelly beans or easy to chew sweets, the list goes on. P.S. Chocolate is not a good option to treat a hypo as it takes too long for the glucose to kick in. At your boyfriend/girlfriend/best mate’s/parent's house. Don’t worry - You are not going to use all these supplies in the first week, it’s just that you can generally guarantee that a ‘hypo’ (especially your first) will take you by surprise and happen when you least expect it. 9. Might be helpful to Get yourself a medical alert ID. Murphy's Law, right - if you have you won't ever need it and if you don't have you will need it. If you do happen to be in need of assistance this will help emergency personnel treat you appropriately. If this totally freaks you out, there are a couple of other options, (though a well-known bracelet like Medic alert is the most easily recognisable symbol if you get into trouble). Engrave a piece of jewellery you wear all the time with something like ‘Diabetes on Insulin’. Carry a card in your wallet (available if you become a member of Diabetes Ireland). You can also input your medical information into your smartphone. At the very least, this is the kind of thing that relaxes our stressed-out mammy’s! People might be very quick to tell you that it’s just diabetes or to be grateful that it’s not something worse as a way to "cheer you up". But it's your life that has just been turned upside down and you are desperately trying to learn how to manage it. I cried every night in my bed for about two months because I couldn’t understand why this had happened to me and how much I hated it. I now know that what I was feeling was normal and that I most definitely wasn't the first, the last or the only one to do so. Adjusting to life with type 1 diabetes may not be easy and believe me when I say that everything you are feeling is normal. You are not alone. Which leads me on to finding others with diabetes. 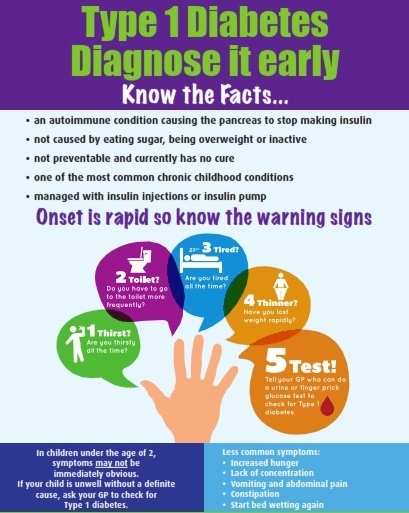 Despite what you may have been told at diagnosis it is not rare for an adult to be diagnosed with type 1 diabetes! There are approximately 17,000 adults living with type 1 diabetes in Ireland today and about half of us were diagnosed as adults. There are people with diabetes everywhere and thanks to social media they are now easier to find. When you feel ready reach out online in social media to connect with other people with diabetes. However, as a newly diagnosed adult, peer support on social media might be overwhelming because of all the information and advice being directed at you by so many. Or maybe this particular group is not the right one for you. There are many, many other options. Here is a list of online and offline diabetes support groups in Ireland to give you an idea of what’s out there. And there are a multitude of diabetes hashtags to follow on Twitter such as #GBDOC, #DSMA, and #OZDoc are just a few.